It has been a long 78-day campaigning. For more than two months, different parties not only highlight their political manifesto, they paint negative images of their opponents. With rising discontent about the existing Federal government leadership in Ottawa, a lot of people have been making loud noises to replace the Conservative government, especially the former Prime Minister, Stephen Harper. Last week, when I was driving along Cambie Street and Broadway, at each corner of the busy intersection were individuals wearing placards that said: "Harper Out!" Evidently, Harper must have stepped on the tails of many people. Perhaps, it was his style of government or policies implemented. Maybe, it was the way he carried himself. Whatever it is, he is no longer Prime Minister. Effectively yesterday, he has resigned from his Conservative Party leadership. The people of Canada have spoken. A new government has been elected and the new Prime Minister-Elect will be Justin Trudeau, the one that Harper has constantly called out: "He's not ready." The voices of Canadians have been loud and clear. They want a new party and a new Prime Minister, anything but conservatives; anything but Harper; anything but the status quo. As of yesterday, the Liberal Party has become the majority government of Canada. Stephen Harper is out and Justin Trudeau is in. The majority of Canadians have voted for change. Many people celebrated through the night. 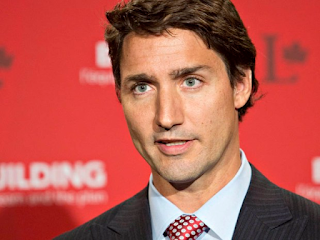 Justin Trudeau gave a rousing and conciliatory victory speech. Today, he even surprised many commuters at a downtown Montreal subway station. You can watch the video here. Amid the celebrations, I hear sadness as well. The NDP leader, Tom Mulcair looked dejected as he conceded defeat in Montreal. Stephen Harper too pledged to work with the incoming party in his gracious speech over at Calgary. The question for this week is this: What about those who didn't vote for the Liberals? "Conservatives are not our enemies. They are our neighbours." If one is not convinced about the state of anti-Harper sentiment, one needs to reflect on why Trudeau had to say things like that. The mood at street level is clear. They may be happy at the Red Tide but they are happier celebrating the demise of the Blue Party, especially now that Harper has resigned. The more I think of it, I concur with Anthony Furey's opinion that Trudeau's win is more emotional than anything else. In the Toronto Sun's article, "Feelings beat facts in Trudeau's Victory," Furey observes pointedly that "This will be remembered as the election where feelings triumphed over facts. The election where style trumped substance." As Christians, what can we do? Here are three things we can do, regardless of which party we voted for or support. The people of Canada have spoken. Whichever party, supporter, or observer, we must respect the will of the people in choosing their government. The positive side is that there is a large voter turnout, which shows that Canadians are passionate about politics and positively concerned about the state of government. There is no apathy. Moreover, a sizeable number of voters are young and hopeful. According to Elections Canada, voter turnout in 2015 is 69.6%, the highest since 1993. Even at University campuses, social media has helped to spur the positive turnout. It is always good to see participation levels rise throughout the country at all levels of society. It augers well because whoever governs will know for sure that they have the mandate by the people, and not just from a small proportion of the population. Before the elections, feel free to support or promote a particular colour or specific party. After the election, there should be just one colour: Canada. This can sometimes be missed out by extremists who fail to see that the rainbow comprises of more than one colour. It symbolizes acceptance of one another regardless of what party we are affiliated to. It means we must stand as one people and one country. We must remain united in the face of challenges that often divide us as a people. When Jesus was asked about which commandment was the greatest, he said LOVE. Love for God. Love for neighbour as much as one loves ourselves. It is about relationships. Our vertical union with God must be reflected in our horizontal relationships with people. We must learn to be colour-blind as far as unity for the nation is concerned. Under God, we are all neighbours. We need to live together as neighbourly as possible. Whether we drive or talk. Whether we communicate on social media or through the press. Whether we support a certain colour or not, we are all neighbours. Christians need to learn what it means to be a neighbour. Paul did not make a distinction of whether it is a left-wing king or a right-wing ruler. Neither did he mention what party they belong to. It is an all-inclusive reference to those in power and in a position of government. As believers, we need to exercise our responsibilities as citizens or residents to pray regularly for them, regardless of what ideology or doctrines we hold. We all have our own opinions. In the eyes of the law, the new government has been elected properly and they need all of our support. Speak up against bad policies. Praise the policies that are good. Encourage them to exercise care and wisdom when in power. This must all be formed in the crucibles of prayer. May every Church be a force to be reckoned with as people pray. Pray against evil. Pray against the forces of darkness that seek to divide the country. Pray for unity among the leaders that the people will be able to live in peace. THOUGHT: There is a difference between a "boss" and a "leader." The boss usually says: "You go!" The leader instead says: "Let us go together."